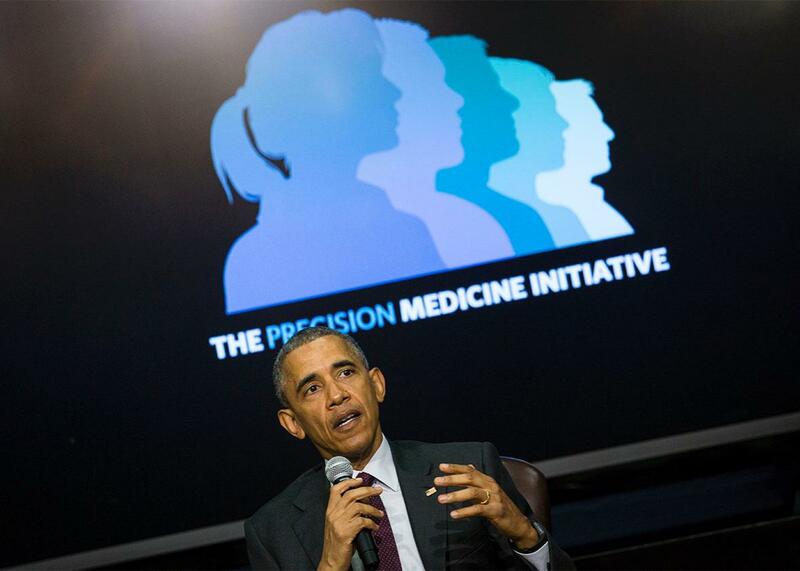 At Precision Medicine Initiative summit Obama says people own their genetic data. Obama speaks at the White House Precision Medicine Initiative Summit on Feb. 25, 2016. On Thursday the White House held a summit to discuss progress on its Precision Medicine Initiative, first announced last year. The program has consistently emphasized that privacy and security are among its priorities when it comes to research data, but on Thursday President Barack Obama waded deeper into a debate about rights and ownership when subjects contribute their genetic information to studies. A major goal of the PMI is to create a diverse database of health and genetic data from 1 million Americans to give researchers an open resource they can use by itself or in conjunction with other work for big data analysis. But amid hopeful suggestions about how this data could improve medicine in the future, Obama pointed to an inherent tension in collecting the data. For those who believe that research subjects should have a role in what their genetic information goes on to do, Obama’s comments are heartening. As the Genetic Literacy Project pointed out in 2014, it may seem indisputable that individuals own their own DNA, tissue, etc. And the Supreme Court said in 2013 that genes cannot be patented. Beyond that, though, most research institutions do consider genetic findings to be their intellectual property, even though experiments are usually based on data from real people. And cases like that of Henrietta Lacks—whose cervical cancer cells were collected in 1951 and have lived on as research cell lines ever since—show how complicated and enduring these ownership disputes can be. For research at the scale of the Precision Medicine Initiative, transparency about this debate is crucial.